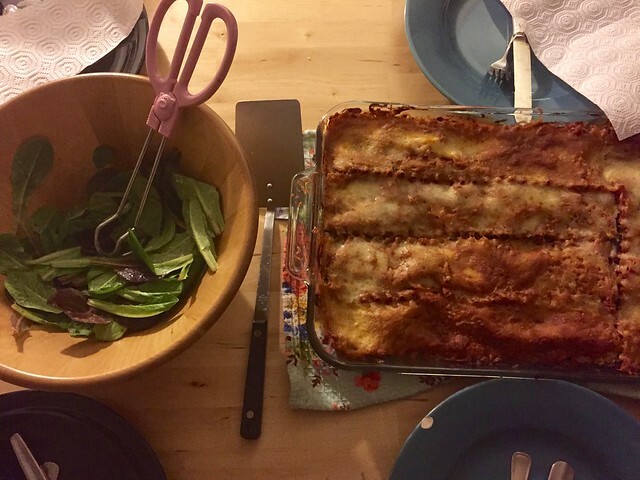 Homemade lasagna! Made on a gloomy rainy day. 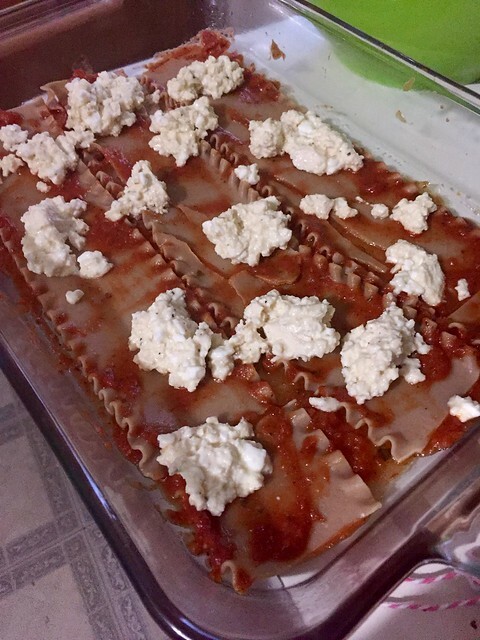 Preboiled whole wheat lasagna noodles, dumped on Trader Joe’s tomato sauce, made “ricotta” from cottage cheese, tofu, egg, parmesan, various dried Italian-ish herbs… probably more but I forget. Til it was tall. Then more tomato sauce and lots of mozzarella on top. 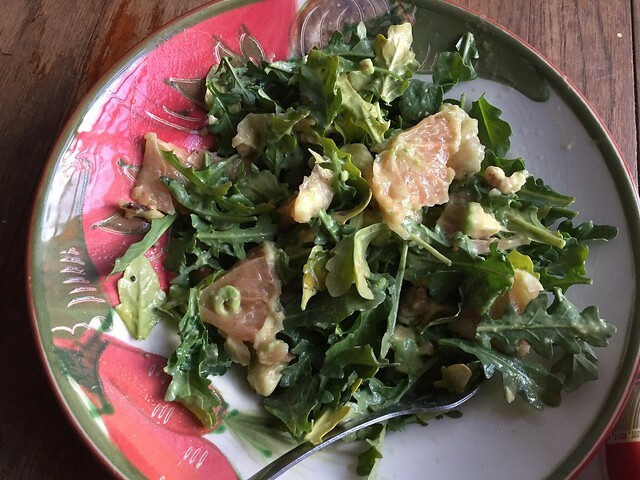 Then green salad on the side because lasagna and salad is such a classic meal. Fortunately, Colton and his sisters were randomly in town so they came over and I fed them lasagna and we made fun of Colton and all was well. THIS! WAS A REALLY GOOD SALAD! 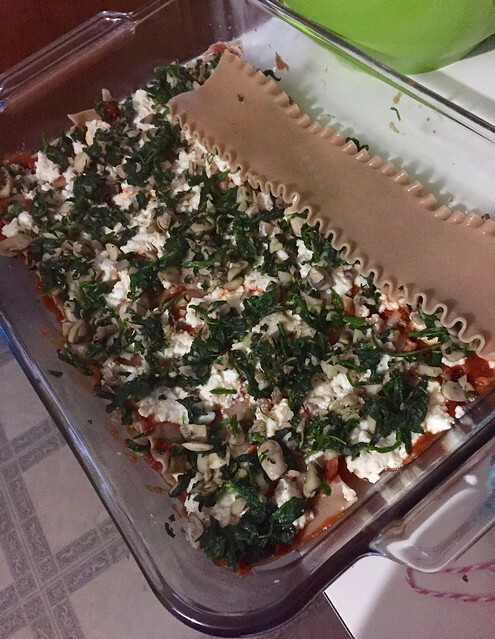 With leftover cottage cheese from making the lasagna. What a spa meal. 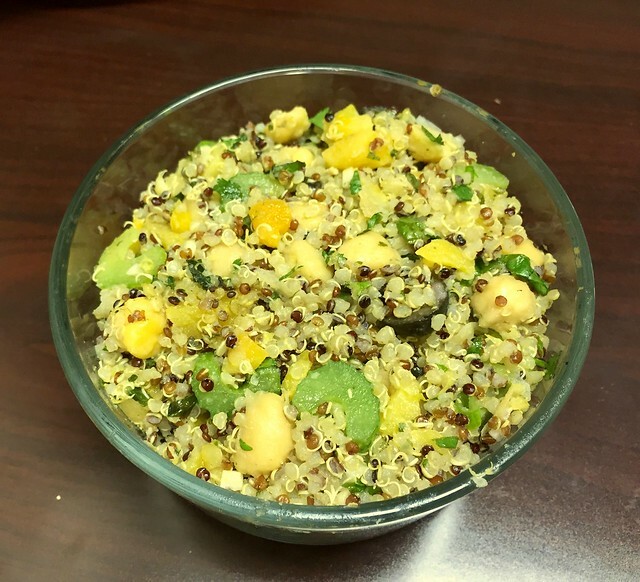 I made this salad from the new Moosewood cookbook that I got for Christmas that involved quinoa, dried apricots, celery, olives, fresh herbs, dressing… pretty good. Ate it for a few days. Breakfast for dinner is so reliably great. I think I’d just gone rather hard at the gym so I was starving? 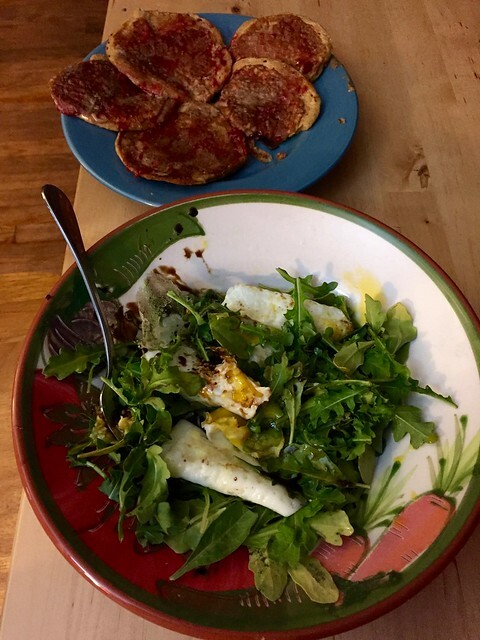 Frozen/thawed pancakes (I alternate between Trader Joe’s excellent seasonal pumpkin spice pancake mix and Kodiak cakes protein pancake mix) topped with peanut butter and jelly, and an arugula salad with fried eggs and balsamic reduction on top. Bread! 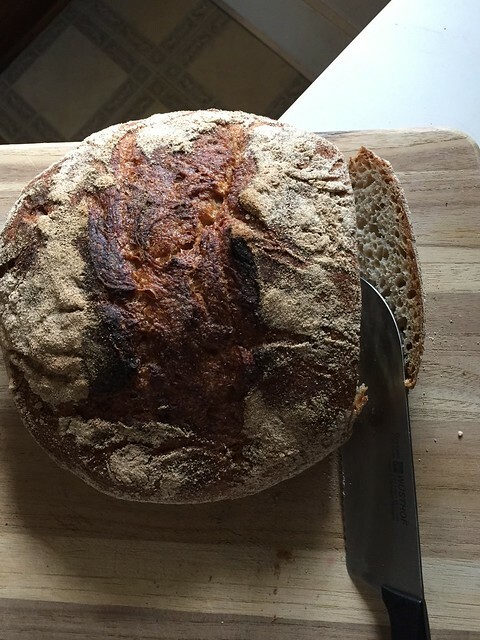 I made the New York Times no knead bread, using 50% whole wheat. 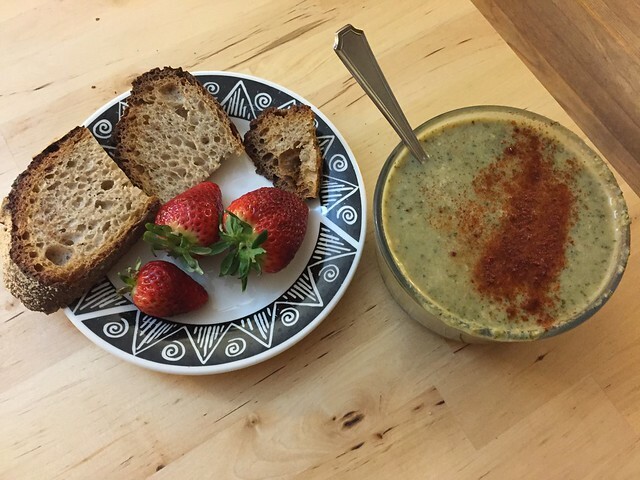 Had it with homemade broccoli cheese soup (livened up a bit with lots of paprika on top) and some strawbs. 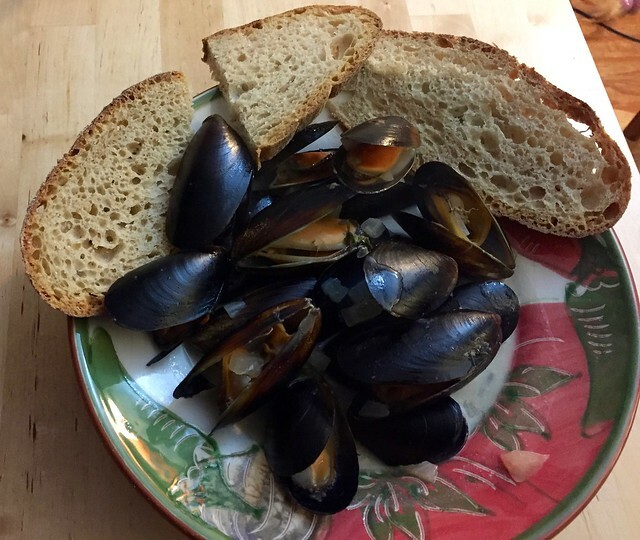 Had it with homemade mussels- OMG THIS RECIPE. The smell in your house. Do it. You will be so happy. 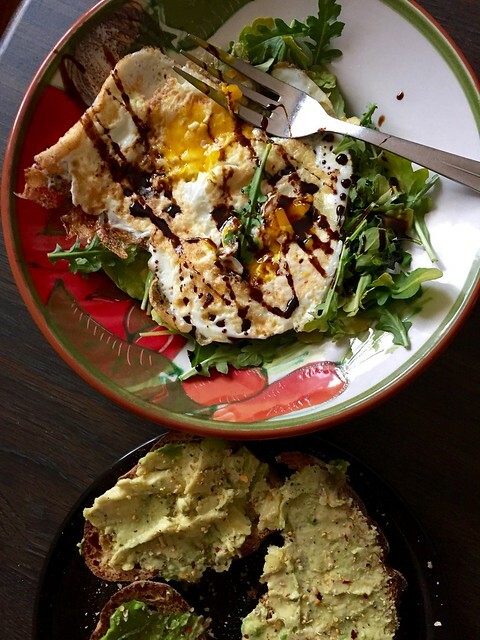 Then more arugula+fried egg+balsamic reduction, with the homemade bread and avocado smashed on top. 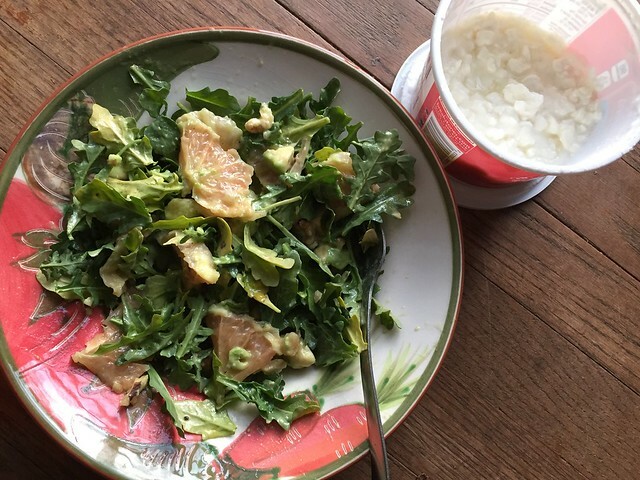 My default meals are basically eggs+ something green and avocado toast. And apparently for this meal I combined those things! Then of course I continue to go out to eat too much. Thank God I hardly ever go to bars so that at least somewhat helps. 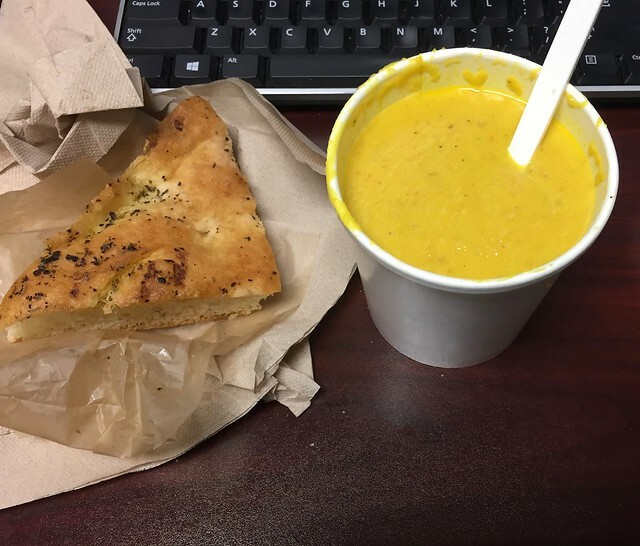 This was really lovely curried butternut soup and focaccia from Mad Hatter. This was the TREMENDOUSLY delicious “Turkish Eggs” from Monuts. 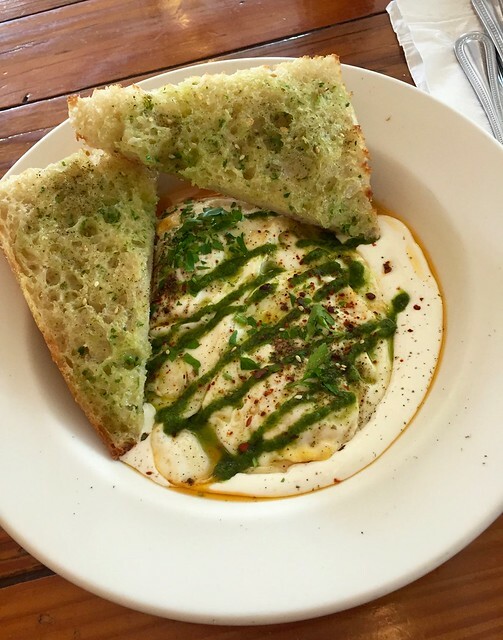 I will quote their menu’s description: “lemon-garlic yogurt, green zhug (parsley and cilantro hot sauce), Aleppo pepper chili oil, two farm eggs, side of za’atar toast.” IF YOU GET A CHANCE, FRIENDS, GET IN ON THIS. Their menu changes a lot so I don’t know how long it’ll be there but fortunately there is always something new and absolutely wonderful on their menu. 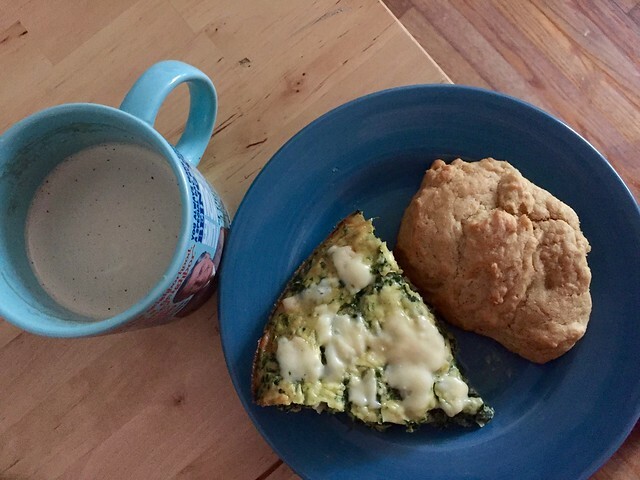 It was Pi Day and Registered Dietitian Day (March 14th!) 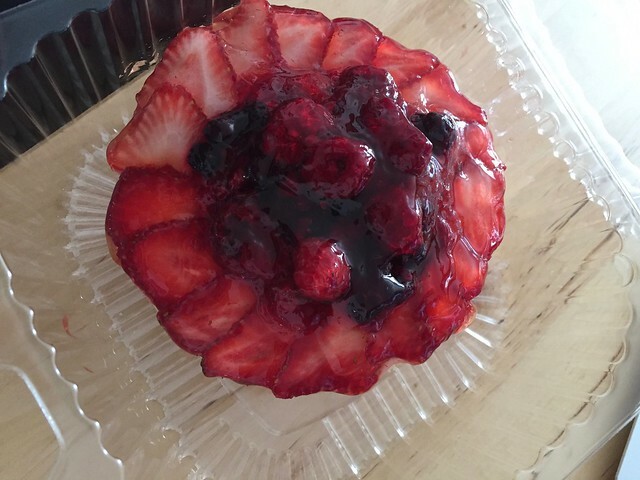 so I got this fruit tart at Guglhupf. It was large. I felt a bit stuffed and packed full of sugar and saturated fat afterwards. But we have to celebrate these things. Another night I got wine and apps with my friend Shaylen. I did not photograph the food because… Shaylen brought Bu. 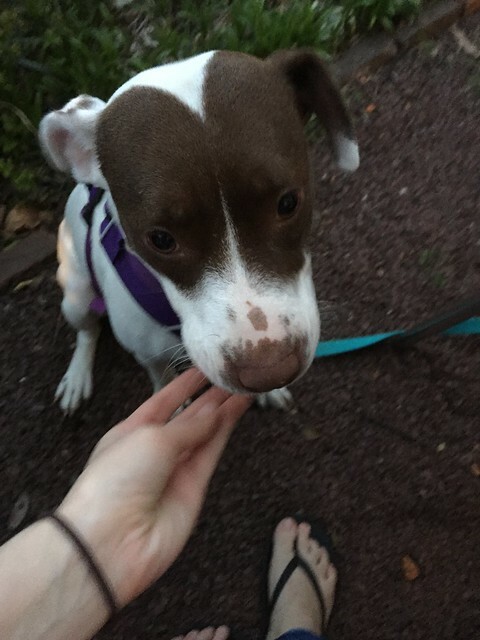 Bu is her and Kyle’s new dog. Bu is a PRECIOUS ANGEL. 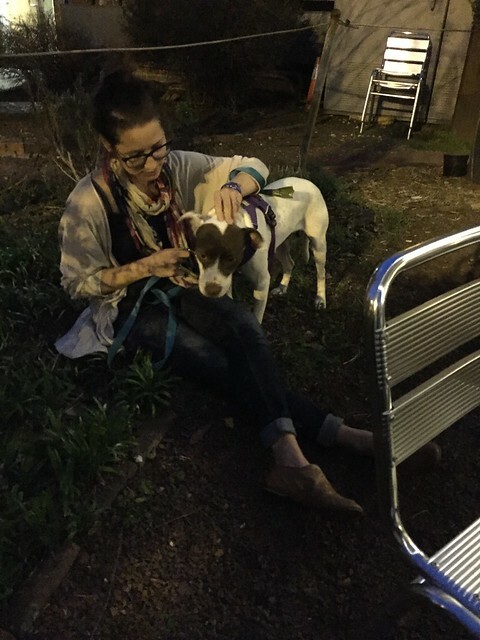 She doesn’t particularly care for sitting around outside patios so she kept wandering into the bushes. At one point Shay went and sat with her in a motherly way I MEAN CAN YOU EVEN WITH THIS PICTURE?! More updates soon probably maybe hopefully. Lots of transitions in my life right now! Lots to share.